THERMOWOOD is a beautiful, sustainable wood material produced by using natural methods, heat and steam. Thermal modification improves the wood’s properties, thereby expanding the range of applications in which the wood can be used. 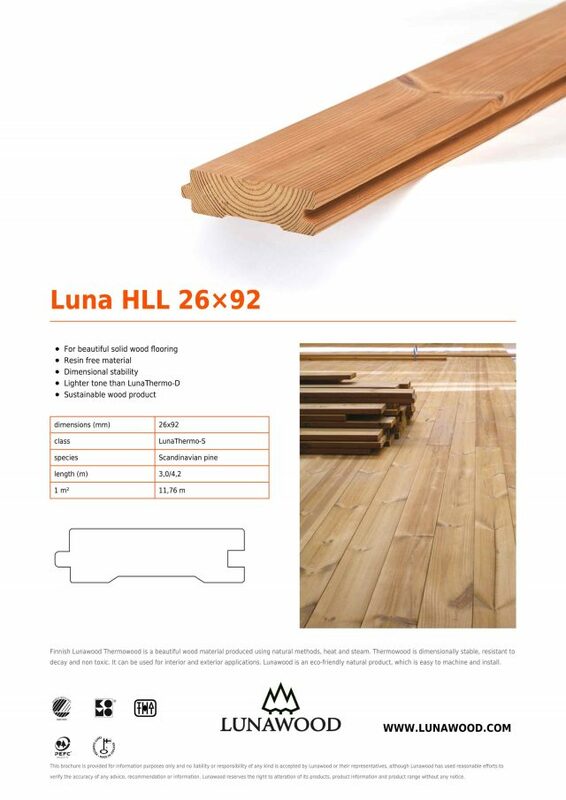 THERMOWOOD is dimensionally stable, resistant to decay and resin free. It can be used inside or outdoors, in any climate. THERMOWOOD is an non-toxic natural product which is easy to machine and install. Due to the breakdown of hemicellulose (sugar chains), the wood no longer contains sufficient nutrients to support fungi which cause decay (KOMO certification). 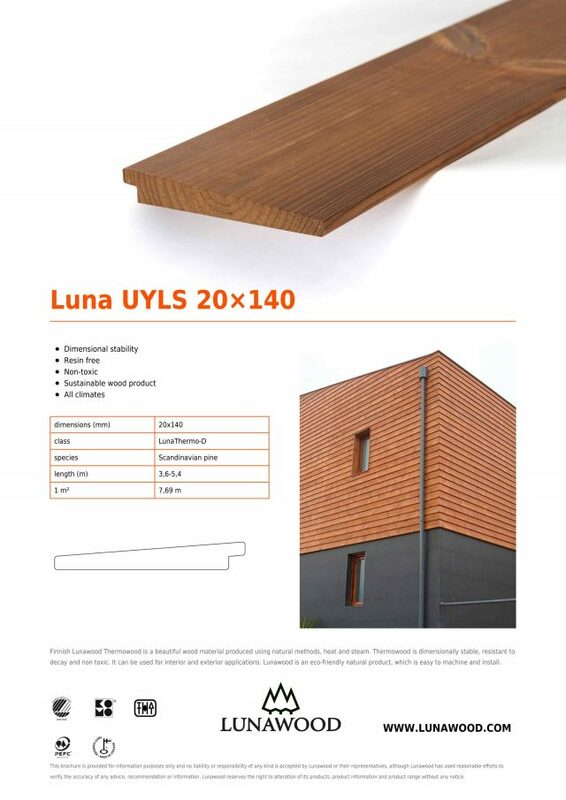 LunaThermoD-class Thermowood has decay resistance class on 2 (durable) (EN 350-2). 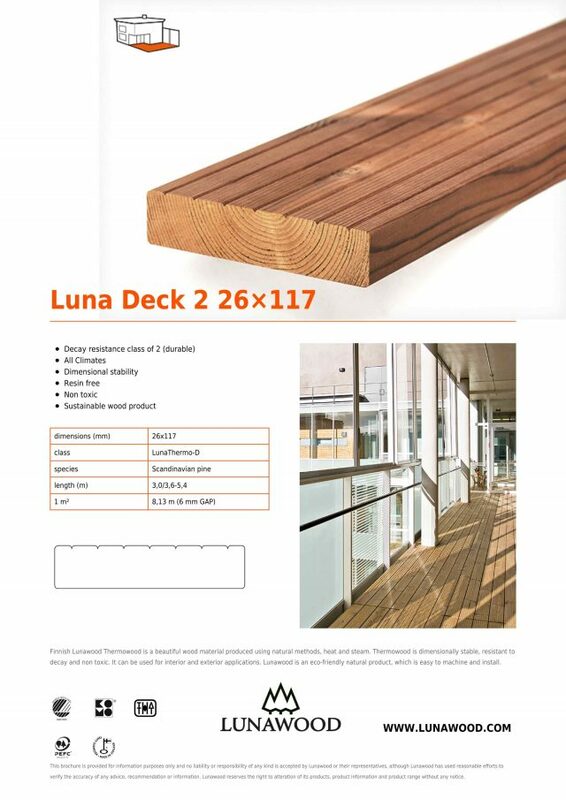 Wood products with decay resistance classes of 1 and 2 are suitable for outdoor use without any additional treatment. 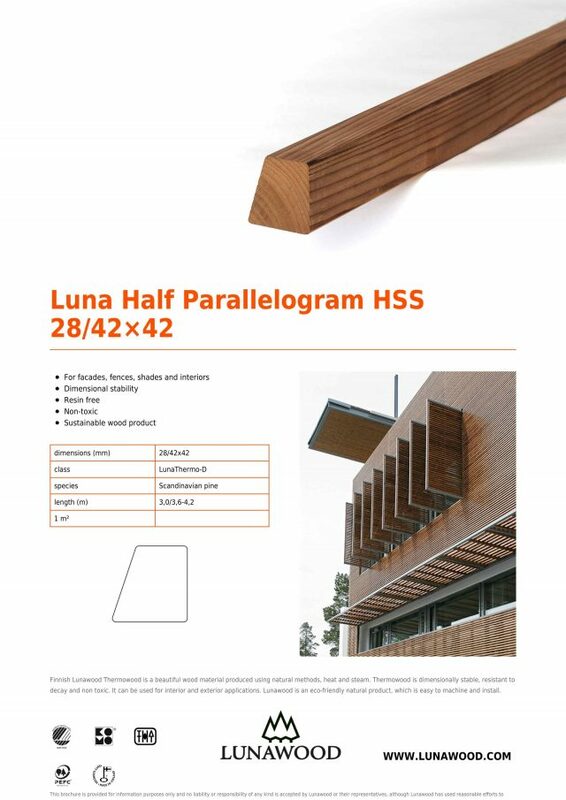 Timber in durability class 2 is suitable for exterior applications above ground without the need for further treatment. After thermal modification, the moisture content of the wood decreases to around 4-6 percent. The equilibrium moisture content is also permanently reduced as a result of thermal modification. The equilibrium moisture content of Thermowood is about half that of untreated wood. As a result of this lowered equilibrium moisture content, Thermowood does not react to changes in humidity as drastically as untreated wood. 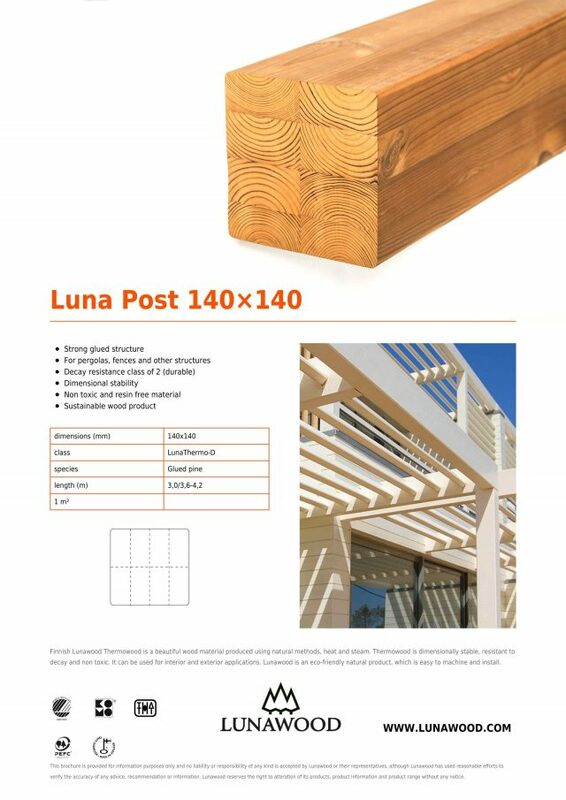 In practice, this means that Thermowood is dimensionally stable and retains its shape far better than untreated wood. 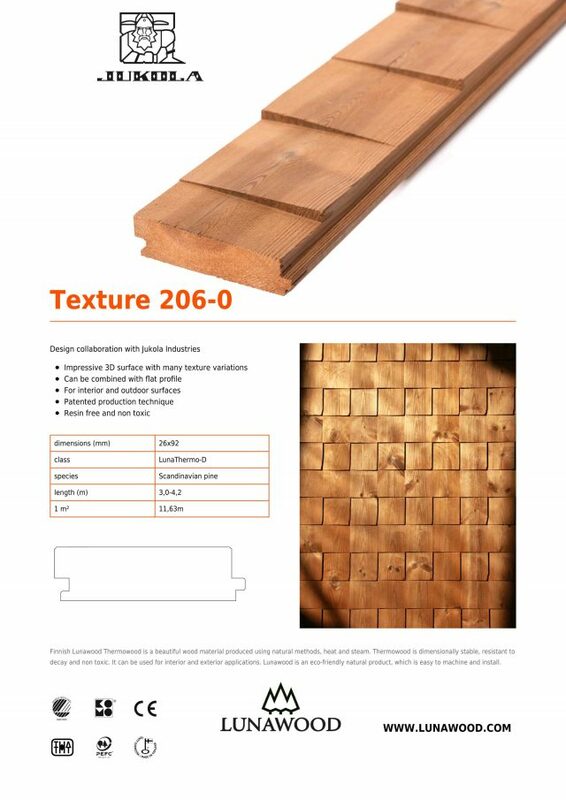 Thermowood is a beautiful wood material produced using natural methods. only heat and steam are used in the manufacturing process and no chemicals are added whatsoever. During the process, steam acts as a protective gas and prevents the wood from splitting and becoming damaged during treatment. Resin is removed from the wood during the thermal modification process. As a result, the wood does not secrete resin even in high temperatures.